Beth Daugherity earned a chemistry degree from ACU and husband Mike is associate professor in ACU’s Department of Engineering and Physics. Beth (Hull ’01) Daugherity was vacuuming when it happened. A strange, unmistakable twinge in her ribs that crackled, like Rice Krispies in milk. Over the next several days, her discomfort grew. She couldn’t sleep on her left side and wondered if she had pneumonia even though she wasn’t coughing. An x-ray revealed a fully collapsed left lung, and Beth underwent surgery and was released. But one morning, she woke up to the familiar crackling in her side, but on the right side this time. 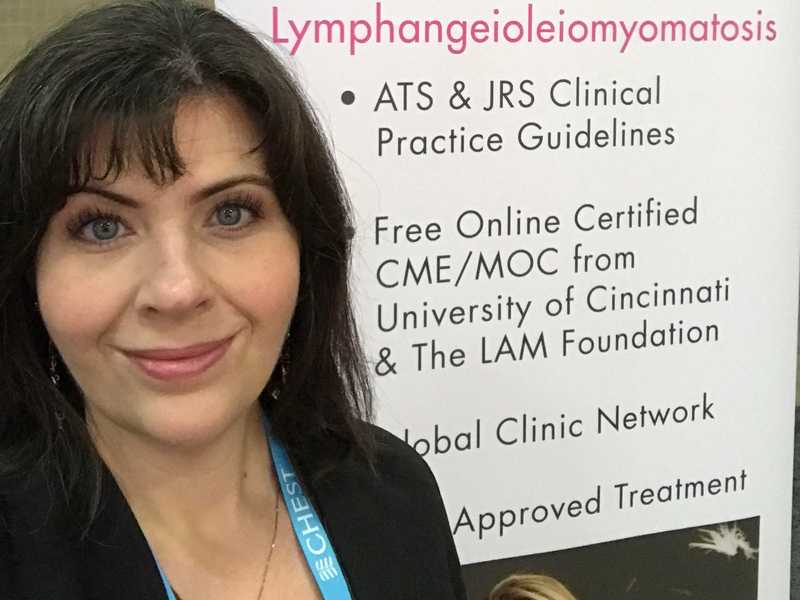 After a second surgery, Beth’s surgeon and pulmonologist delivered a devastating diagnosis: lymphangioleiomyomatosis. Lymphangioleiomyomatosis, or LAM, is an extremely rare pulmonary disorder defined by a growth of smooth muscle cells throughout the lungs, pulmonary blood vessels, lymphatics and pleurae. LAM is progressive and eventually leads to respiratory failure and death. The disorder is so rare that Beth’s surgeon had to practice pronouncing it before giving her the news. Throughout her pulmonologist’s career, he had only had one other LAM patient, and she died while waiting for a transplant. Beth was given a prognosis of five years. Beth and her husband, Mike (’02), are both scientists. She earned a chemistry degree from ACU, and Mike is an associate professor in ACU’s Department of Engineering and Physics. Researching comes naturally to the Daugheritys, so they dove into journal articles, National Institute of Health data, the LAM Foundation website and the LAM clinic at the University of Texas Southwestern Medical Center in Dallas to learn as much as they could about this complicated disorder. Meanwhile, Beth’s lungs were not holding up. By the end of 2015, she had nine lung collapses, four lung surgeries, 15 chest tubes and 13 pleurodeses – the procedure that induces scar tissue and adheres the lung to the chest wall in an attempt to prevent more lung collapses. Throughout her excruciating and terrifying ordeal, Beth noticed that her lungs leaking and collapsing seemed to line up with her ovulation and menstrual cycles. Her doctors had never mentioned a hormonal link, but she had tracked her cycles for 15 years and noticed that many months, she had documented rib pain and chest pressure during her cycles–going back to her college years. Doctors had dismissed Beth’s complaints of these symptoms over the years, but with her more recent issues, she had more evidence and research to support her theory. Beth got her gynecologist on board, who agreed that Beth’s lung issues were hormone-driven and that she needed an oophorectomy (surgical removal of the ovaries). After the surgery and hormone suppression therapy, Beth’s lungs healed and she has now been stable since 2016. She’s not symptom-free and still has lingering pain from the trauma to her chest and back. But not enough to slow her down. In a profound coincidence, the Texas Tech University Health Sciences Center in Abilene has opened a lab devoted to researching LAM. This spring, after finishing three catch-up biochemistry courses, Beth hopes to begin a PhD program at TTUHSC to further research LAM. She also hopes to spread more awareness about the disease. “I would love to do some combination of public speaking, fundraising, research coordination, and perhaps teaching,” said Beth, who is grateful every day that at least in her case, she and her doctors were able to find an answer. View more from Deana Nall. What an amazing discovery! Bless. My husband, who also attended ACU, was a veterinarian; he died of pulmonary fibrosis. I am grateful for any progress made in researching lung diseases; at least one and maybe two of his uncles also had pulmonary fibrosis. Thank you for sharing. May God bless her efforts to find help for lung diseases. It’s true – if you can’t breathe, nothing else matters.